Lisa E. Gordon-Hagerty serves as the Under Secretary for Nuclear Security of the U.S. Department of Energy (DOE) and Administrator of the National Nuclear Security Administration. She was confirmed by the U.S. Senate on February 15, 2018. With more than 30 years of national security experience, Ms. Gordon-Hagerty is responsible for the management and operations of NNSA in support of President Trump’s and Secretary Perry’s nuclear security agenda. Ms. Gordon-Hagerty served previously in several U.S. Government leadership positions, including as the Director for Combating Terrorism, National Security Council staff, directing overseas crisis and consequence management and responsible for coordinating the U.S. Government’s activities to deter, disrupt, prevent, and respond fully to conventional, biological, chemical, nuclear or radiological WMD attacks, through research and development, special operations, intelligence, and exercises/contingency planning. 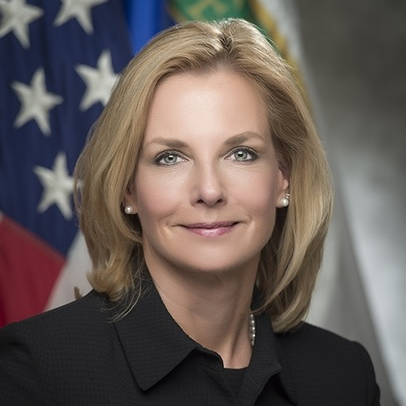 She also served at DOE in Defense Programs as the Director, Office of Emergency Response, administering and directing the Nation’s technical nuclear emergency response programs and assets utilized in response to nuclear terrorism, radiological accidents, nuclear weapons accidents and major radiological emergencies worldwide, and as Acting Director, Office of Weapons Surety. Ms. Gordon-Hagerty was a professional staff member on the U.S. House of Representatives Committee on Energy and Commerce, providing technical support to Committee Members on issues related to DOE national security issues. She began her professional career as a health physicist at DOE’s Lawrence Livermore National Laboratory. Prior to joining the Trump Administration, Ms. Gordon-Hagerty was president of Tier Tech International, Inc., a Service Disabled Veteran Owned Small Business providing professional expertise to combating weapons of mass destruction terrorism worldwide. She was also president and CEO of LEG, Inc., a consulting firm focusing on national security issues. Ms. Gordon-Hagerty served as the Executive Vice President and Chief Operating Officer of USEC, Inc.
Ms. Gordon-Hagerty holds a Master of Public Health degree in Health Physics and a Bachelor of Science, both from the University of Michigan. Check out the incredible speaker line-up to see who will be joining The Honorable Lisa.